The new wagon gives Panamera buyers of having more carrying capacity and a wide selection of engine options. 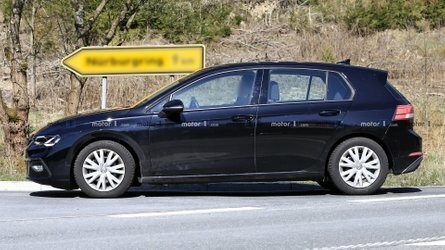 The production version of the Porsche Panamera station wagon has seemed like an absolutely phenomenal idea since the first spy photos revealed its fashionable look a little over a year ago. With the official debut at the 2017 Geneva Motor Show, we know that the Panamera Sport Turismo looks every bit as good as in our dreams. 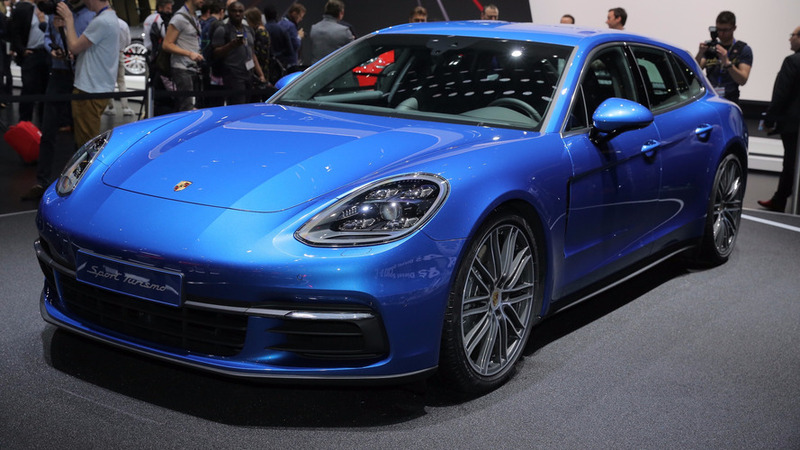 The Sport Turismo is on display in Switzerland as the 4S trim in cerulean blue, which really makes the contours pop, and the Turbo in a light shade of gray, which appears a little more mature. Regardless of color or trim, customers get a vehicle with all the style of the Panamera and the added ability to load about 18.4 cubic feet (52 liters) of cargo in the back, which expands to around 49 cubic feet (1,390 liters) with the seats down. 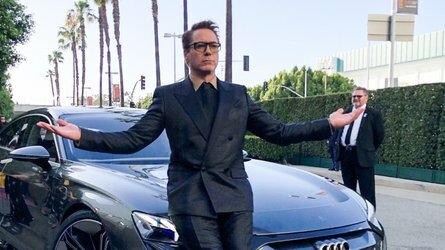 In comparison, the regular sedan has 17.4 cubic feet (493 liters) of storage space in the trunk or 46 cubic feet (1,303 liters) with the back row of chairs out of the way. 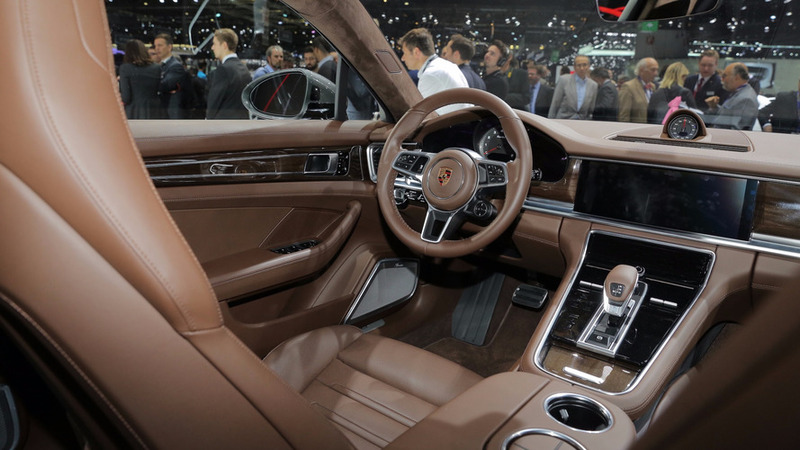 Porsche’s designers generally retain the existing Panamera look but extend the roof rearward. A steeply raked rear window keeps the model from looking too boxy. As a sporty touch a power-extending spoiler deploys from the back at speeds above 56 miles per hour (90 kilometers per hour). 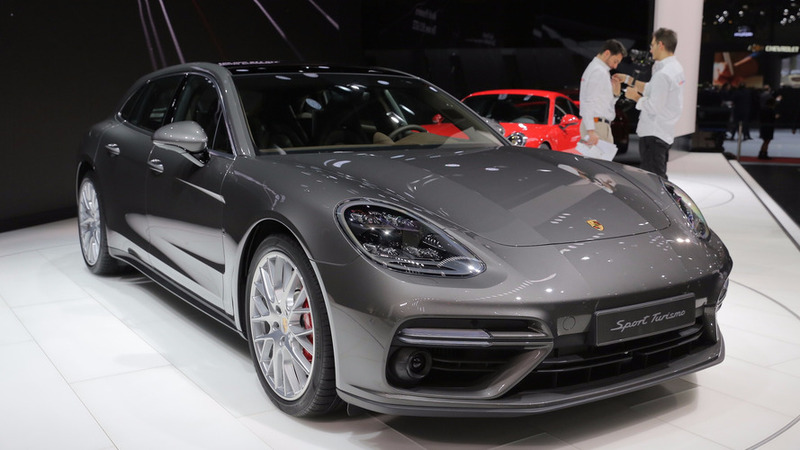 The Sport Turismo offers 4+1 seating according to Porsche. The back features a pair of buckets, and a person can sit between them in a pinch. 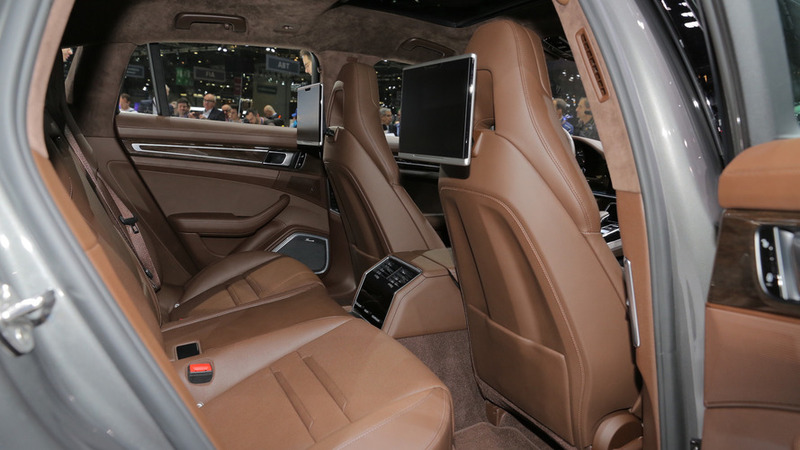 Photos suggest it wouldn’t be a very comfortable ride because that person would need to straddle the center console. At least in Europe, Sport Turismo buyers have a plethora of engine options to pick from. 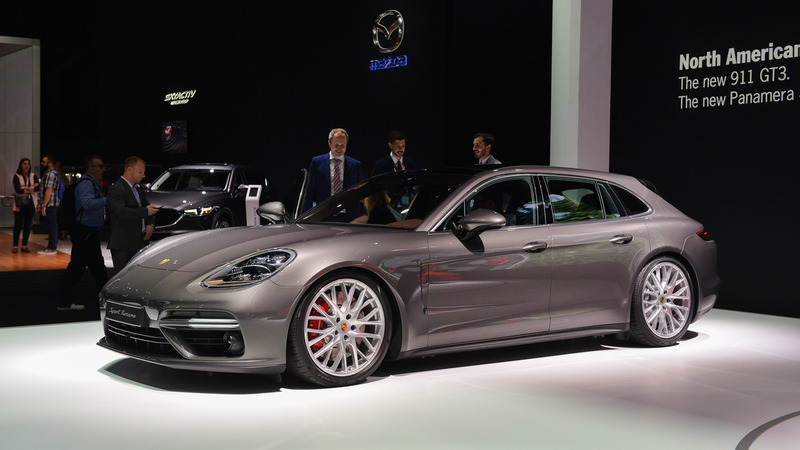 The base Panamera 4 has 326 horsepower (242 kilowatts); the 4S Diesel boasts 416 hp (310 kW); the 4S Sport offers 435 hp (324 kW); the E-Hybrid Sport has a total output of 456 hp (340 kW); and the Turbo tops the range with 542 hp (404 kW). The Panamera Sport Turismo goes on sale in Europe on October 7, 2017. 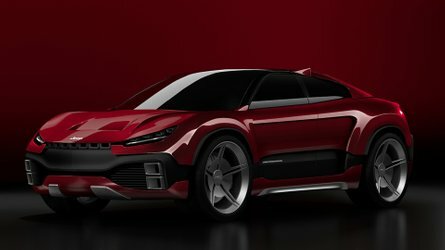 The company says the wagon debuts in “other markets” in early November. Porsche will eventually offer the model in the United States, but the firm’s boss for the region says that it doesn’t arrive at American dealers in 2017. Stuttgart. 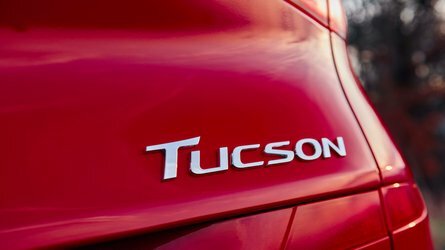 Porsche is expanding the Panamera family with the addition of a new body version: The Panamera Sport Turismo is celebrating its world première at the Geneva Motor Show (March 7 to 19, 2017), where five different versions will be on display: Panamera 4, Panamera 4S, Panamera 4S Diesel, Panamera 4 E-Hybrid and Panamera Turbo. Based on the successful sports saloon, the new version once again makes a profound statement in the luxury segment with its unmistakeable design. At the same time, the Sport Turismo, with up to 404 kW/550 hp, is more versatile than any other model in its class. With a large tailgate, low loading edge, increased luggage compartment volume and a 4+1 seating concept, the new Panamera model offers the perfect combination of everyday usability and maximum flexibility. 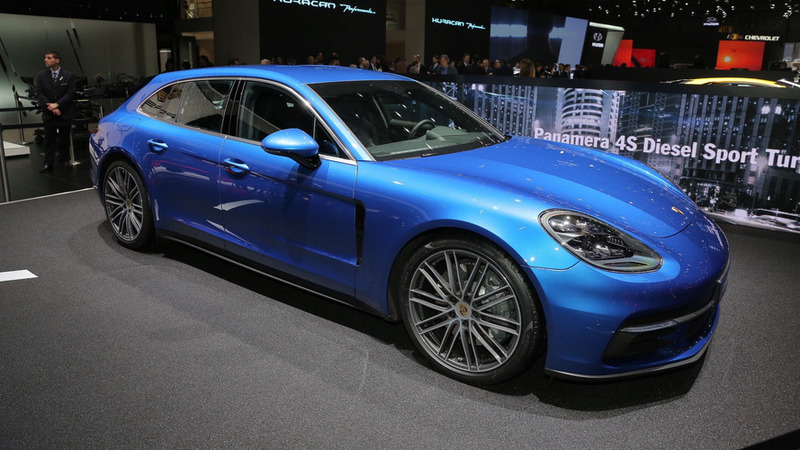 “For Porsche, the Panamera Sport Turismo is a step forwards into a new segment, but retains all of those values and attributes that are characteristic of Porsche”, says Michael Mauer, Director of Style Porsche. Just like the coupé-style Panamera sports saloon, the Sport Turismo is characterised by its very dynamic proportions – a perfect reflection of the Porsche design DNA. The vehicle is 5,049 millimetres long, 1,428 millimetres high and 1,937 millimetres wide, while the large wheelbase spans 2,950 millimetres. The silhouette is further characterised by short body overhangs and large wheels measuring up to 21 inches. At the top of the vehicle, the roof extends into an adaptive spoiler. 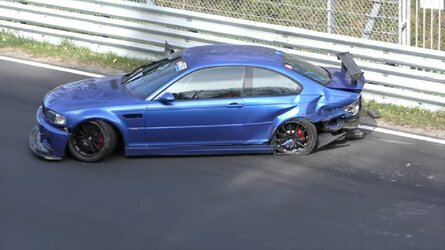 The angle of the roof spoiler is set in three stages depending on the driving situation and selected vehicle settings, and generates an additional downforce of up to 50 kg on the rear axle. The raised roof line of the Sport Turismo allows for easier entry and exit at the rear of the vehicle and ensures greater head clearance. The usability of the luggage compartment benefits from the wide opening tailgate, which is electrically operated as standard, and a loading edge height of just 628 millimetres. Measured to the upper edge of the rear seats, the up to 520-litre storage capacity of the Sport Turismo (Panamera 4 E-Hybrid Sport Turismo: 425 litres) betters that of the sports saloon by 20 litres. When loaded up to roof level and with the rear seats folded down, the gains amount to around 50 litres. The backrests of the three rear seats can be folded down together or individually (in a 40:20:40 split) and are unlocked electrically from the luggage compartment. When all of the backrests are folded down, the loading floor is virtually level. In this case, the storage volume is expanded to up to 1,390 litres (Panamera 4 E-Hybrid Sport Turismo: 1,295 litres). The Panamera Sport Turismo is available to order now. The European market launch is scheduled for October 7, 2017, with the other markets following in early November. The new Porsche will be available with five engines that are already used in the sports saloon. 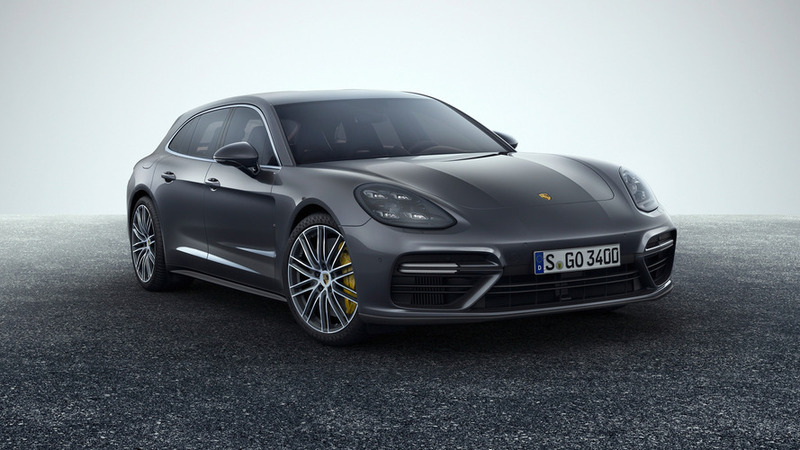 Prices in Germany start at 97,557 euro for the Panamera 4 Sport Turismo (243 kW/330 hp), 112,075 euro for the Panamera 4 E-Hybrid Sport Turismo (340 kW/462 hp system power), 120,048 euro for the Panamera 4S Sport Turismo (324 kW/440 hp), 123,975 euro for the Panamera 4S Diesel Sport Turismo (310 kW/422 hp) and 158,604 euro for the Panamera Turbo Sport Turismo (404 kW/550 hp), all including VAT.